Isn't Hebrew just the right language for love letters? Even better if you decide to etch the letter permanently into your skin. 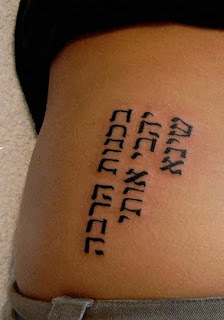 This wonder of a Hebrew tattoo was composed by a Korean tattoo artist, a guy who constantly mangles Hebrew as a hobby. His other work was featured on Bad Hebrew Tattoos earlier this year. I don't really know what's going on here. Is he asking Shina to love him? Is he declaring his love for Shina? Is he signing his message as Shina? Be as it may, when visiting a foreign country which isn't Israel, you're advised to refrain from getting a Hebrew tattoo. Even if the price is right, the message will probably be wrong. Haval al ha'ke'sef. And the worst part is, Shina looked at it and then told him "Frankly, Frank, I do kinda like you some...but I think we start seeing other people..." Oh well, mebbe he'll find another Shina. Actually, יהב can mean gift, as in the Parasha of Chukat: "Et Vahev BaSufa..." See Rashi therein, where he explains that Vahev is another form of Yahev or Yahav. In fact, it is common for the family name Vahav to also be written Yahav. i kinda love the unique grammar on this one.